Suffering from achy, painful knees? Try these soothing yoga poses to strengthen your knees and melt away pain. If you’re suffering from knee pain, you’re not alone. There’s been a surge of “wear and tear” joint problems and knee replacement surgeries are on the rise (1). Common causes of knee pain include excess weight on the knees and using improper technique during exercise. With these yoga poses, you can help to prevent knee damage while repairing current injuries. The yoga poses shown below can help stretch and strengthen the muscles surrounding the knees, which prevents tight muscles from making joint pain worse. They also help to strengthen the surrounding muscles, providing needed stability. Another bonus: A consistent yoga practice can help you lose weight, decreasing the daily pressure applied to those knees! Try these 11 yoga poses that work the surrounding muscles for knee pain relief. This yoga pose helps to stretch the tensor fascia latae (TFL), the gluteus medius, and the hamstrings, relieving tension on the IT band and the knees. Begin standing. Cross your right ankle in front of your left, keeping your pinky toes as close together as possible. Keep a micro-bend in both knees. Engage your abs, then exhale as you fold forward with a flat back. Set your fingertips on the mat or onto a yoga block. Walk your hands over to the right side of your mat and gently press your hips to the left to feel a stretch on the outside of the left hip, thigh, and hamstrings. Hold for eight slow breaths, then walk your hands back to center and slowly stand up. Switch sides. This pose stretches tight hip flexors and quadriceps, relieving tension on the knees. Begin by lying down on your belly. Prop yourself up onto your forearms and engage your abs. Turn your left forearm to point your left fingers towards the top right edge of your mat. Bend your right knee and reach your right arm back to catch the inside of your right foot. Keep your abs engaged as you gently draw the right foot in towards the glutes, feeling a stretch through the right quadriceps. Hold for eight breaths, then gently release the right foot. Switch sides. 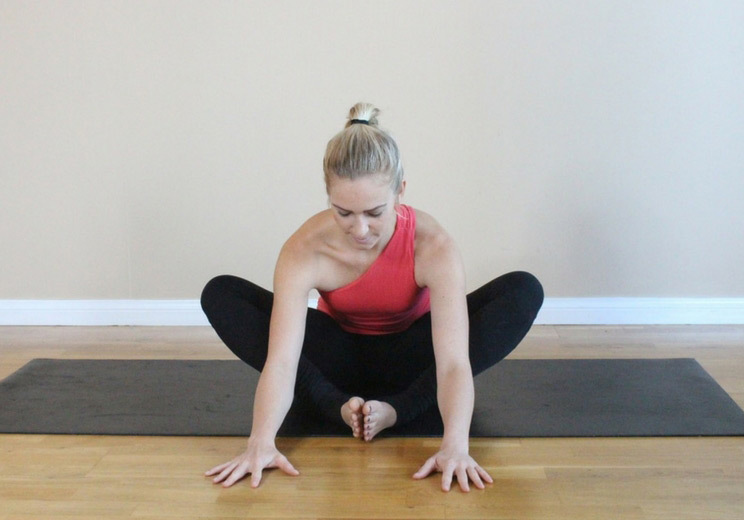 This pose releases tight hamstrings, protecting the back of the knee joint. Start by lying down on your back with your knees bent and feet flat on the mat. Grab hold of your right ankle with both hands. Straighten out the right leg towards the ceiling so that you feel a stretch through the back of the leg. Straighten your left leg down your mat with the foot flexed and active. Engage your abs and hold for eight breaths, then switch sides. 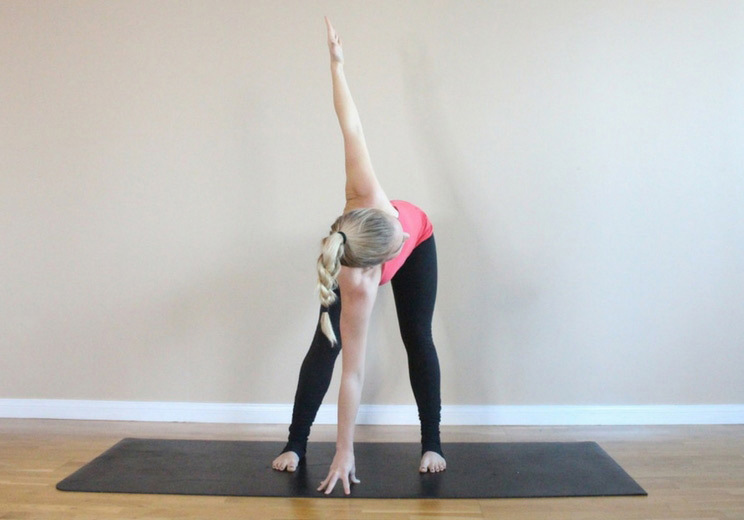 This pose opens up the hips, glutes, the TFL, and IT band to reduce tension on the knees. Cross your right ankle over your left thigh. Flex both feet to protect the knee joints and engage your abs. Lift your left foot up off the mat and interlace your hands behind your left thigh. Keep your head and shoulders down and hold for eight breaths. Switch sides. This stretch helps to open up the TFL, gluteus medius, and hamstrings. The twisting motion also helps to increase digestion, aiding in weight loss. Start with your feet out wider than hips-width. Exhale and, with a flat back, fold forward. Place your right palm on the mat. Bend your right knee slightly and keep your left leg straight. Inhale and lift your left arm high, twisting through your chest. Feel a stretch through your outer left hip and thigh. Hold for eight breaths then lower your left hand back down. Switch sides. This pose strengthens the quadriceps, hamstrings, glutes, and core – providing stability to the knee joints. It also builds internal heat to speed up metabolism and aid in weight loss. Begin standing up with your feet out wide. Turn your toes out at 45-degree angles. Bring your palms together at heart center and engage your abs. On an exhale, sit your hips back and down like you are sitting into a chair. Keep your chest lifted and squeeze your shoulder blades together. Make sure to keep your knees in line with your toes. Hold for eight breaths, then stand up on an inhale to release. This pose relieves tension in the hips, glutes, TFL, and quadriceps. Begin seated on your mat. Bring the soles of your feet together in a butterfly and allow your knees to fall out wide. Bring your heels closer to your body for a deeper hip stretch. Place your hands on your mat in front of you and inhale to find a long spine. Keeping your sitting bones rooted, exhale to walk your hands out further, working your forearms towards the ground. You should feel a release through the hips, thighs, and lower back. Hold for eight breaths. 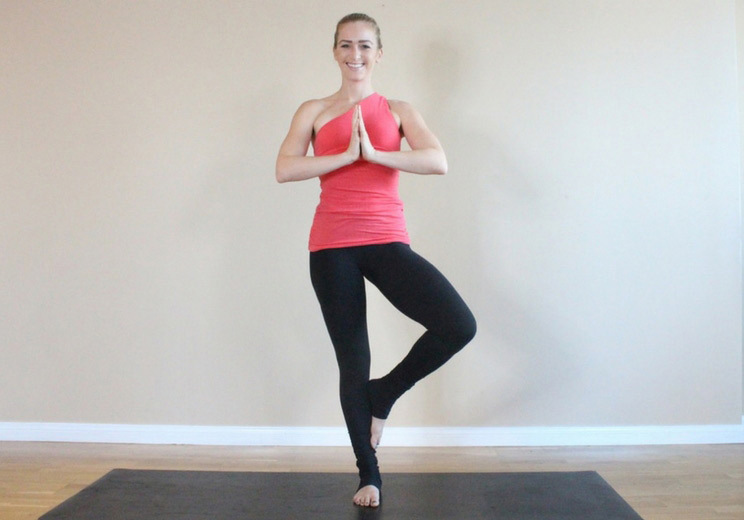 This balancing pose helps to strengthen stabilizing muscles around the knee, ankle, and hips. Start standing with your feet together. Place your palms together in front of your heart and engage your abs. Keep your gaze on one, unmoving point. Shift your weight onto your left foot and slowly pick your right foot up off the mat. Place your right foot on the inside of your left calf. Return hands to heart center. Stand tall with your belly engaged and hold for eight breaths, then slowly release. Switch sides. This pose strengthens the quadriceps and hamstrings, providing strength and stability to the knees. Start lying down on your back with your knees bent and your feet on the floor. Place your arms down by your sides with your palms face down. Walk your heels back towards your fingers so that your ankles are under your knees. Engage your abs. Press into your palms and inhale to lift your hips up towards the ceiling. Engage your glutes to protect your knees. Hold for eight breaths. This pose opens up tight hip flexors, hamstrings, quadriceps, and the TFL. Bend your knees and draw them into your chest, flexing your feet. Grab hold of the outer edges of your feet, ankles or thighs, with your knees on the outer edges. Engage your abs and firmly press your sacrum down into the mat. Gently kick your legs into your arms to feel a stretch in the groin. You can rock slowly side-to-side to massage the lower back. Hold for eight breaths and then release. This side plank variation stretches the gluteus medius, the TFL, and IT band while simultaneously strengthening the core, quadriceps, and hamstrings. Start in a high plank position with your shoulders stacked over your wrists and your hips in line with your shoulders. Pull your navel up and in towards your spine to engage your abs. Step your left foot about a foot behind your left wrist. Then, spin to the pinky toe edge of your right foot. Stack your left hip over your right as you shift the weight onto your right palm. Lift your left hand up and place it on your left hip. Turn your left foot to point forward and lift up through your left hip. You should feel a stretch through your right hip and both thighs. Hold for eight breaths, then switch sides.